If everyone agrees that being kind is cool, how come your students still struggle with kindness? Time to face reality: being kind is not always as easy as we make it out to be! How do we help kids be kind throughout the year? These tips can help! How can we create a culture of kindness? What does it mean to be kind? It means a whole lot more than “being nice!” Instead, being kind involves being aware and concerned about the well-being of those around you- and then taking positive action based on that concern. It includes some really nitty-gritty stuff like challenging stereotypes. The new middle school curriculum, Create a Culture of Kindness in Middle School , addresses that tricky issue, as well as inclusion, compassion, empathy, perspective-taking, bullying, and conflict resolution. Based on that work, I’ve included below a link to ’21 Kindness Tips’ that invite you to go beyond “being nice.” We had a great conversation about these tips during my talk on “Raising Kind Kids” at the Doylestown Bookshop. My 9-year-old daughter and I truly enjoyed Christa’s discussion about creating a culture of kindness, not just in schools, but in our lives. We discussed the value of listening to others, creating a climate of openness and emotional safety. My daughter was encouraged to share her thoughts about how she could be a better listener at school during times when she doesn’t feel like listening (her words). As a parent, I’m reminded that our children need and deserve eye contact and to be given our full attention amidst the ever-present distractions of technology. I was grateful that my daughter was there to learn about being an upstander and receive tips on how to support the unsupported. Christa is a gem, and our community is very lucky to have these conversations with her! ~ Meena Dershin, parent and Licensed Professional Counselor. Use the tips at home or school as conversation starters and reminders of how our actions have a big impact on others, and our community. Get the 21 Kindness Tips ! 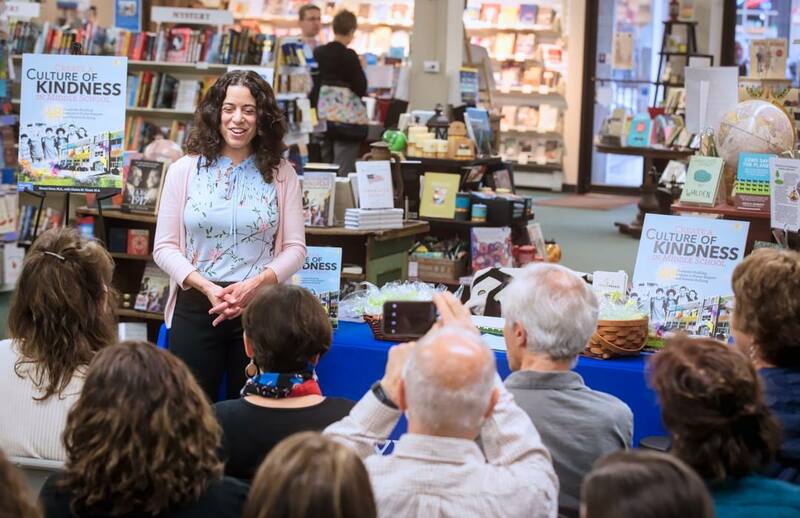 “Raising Kind Kids” talk at the Doylestown Bookshop. 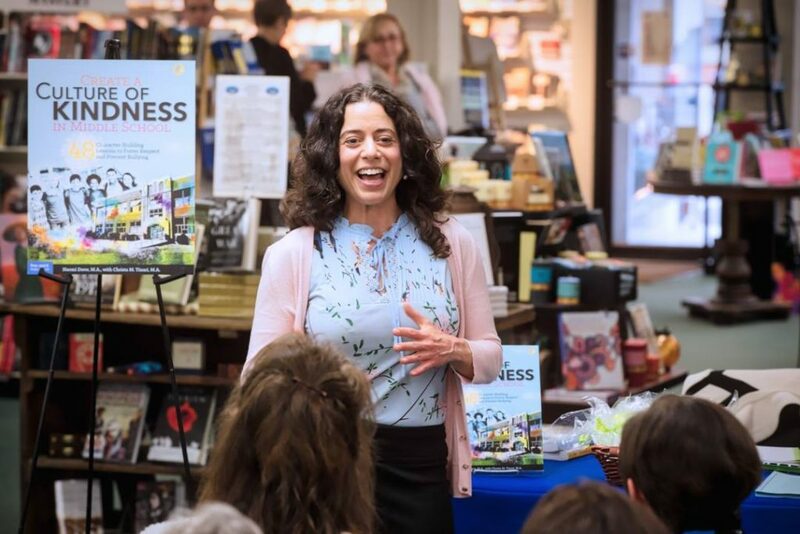 The Create a Culture of Kindness in Middle School book launch, led by author Christa Tinari, had a celebratory feel and engaged every attendee present. 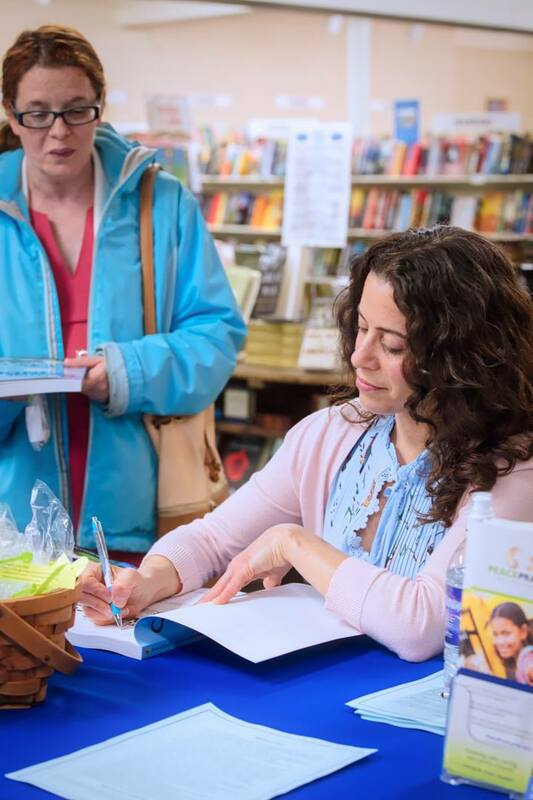 On April 26th at 6:30pm, the Doylestown Bookshop hosted an audience consisting of the book’s co-author Naomi Drew, community members, parents with children of various ages, non-profit leaders, teachers, and students. During the free thirty-minute talk on “Raising Kind Kids” Christa Tinari provided a concise talk focusing on ways to foster empathy and understanding in children and youth. She shared with participants a handout consisting of 21 kindness tips and actions. Access the 21 Kindness Tips here! The interactive conversation that ensued included practical ways to implement the ideas at home and school. Ms. Tinari’s passion and expertise ignited a momentum for change among the crowd. The audience’s enthusiasm was contagious and many said they felt better prepared and were excited to take more action for kindness! After signing the purchased books, Ms. Tinari sent attendees off with a small goodie bag with a “kindness makes a difference sticker,” chocolate kisses, and a reminder of one of the 21 tips. They also walked away empowered by having learned a lesson or two from the author and her book, Create a Culture of Kindness in Middle School: 48 Character-Building Lessons to Foster Respect and Prevent Bullying. As a prelude to the book launch, PeacePraxis created a virtual event on social media which asked for random acts of kindness to be performed. Participants shared their efforts using #actionforkindness. In the morning, Ms. Tinari presented a talk on “Creating a Culture of Kindness at School” to 75 NJ educators and counselors. Dragonfly Yoga Studio joined as an Action for Kindness Partner, and hosted a free, lunch-hour compassion meditation class that was well attended. Another event was co-sponsored by Girls Empowered and Nina’s Waffles which focused on raising self-esteem and provided an interactive photo booth with positive affirmations. Thanks to the Doylestown Bookshop, Dragonfly Yoga Studio, Girls Empowered and Nina’s Waffles for partnering with PeacePraxis to celebrate Action for Kindness Day 2017! To purchase a copy of Create a Culture of Kindness in Middle School: 48 Character-Building Lessons to Foster Respect and Prevent Bullying, visit Free Spirit Publishing . Use coupon code CULTURE for a 25% discount! Founding Director of PeacePraxis, Christa Tinari, is pleased to welcome new Outreach Coordinator, Heidi Roux! Heidi’s professional experience is in nonprofit management and program development. She has developed and implemented various awareness and advocacy campaigns in education and around issues involving children and youth. Heidi has an MBA from Northern Arizona University. While in the market research field, she co-authored various studies on social and public health issues. 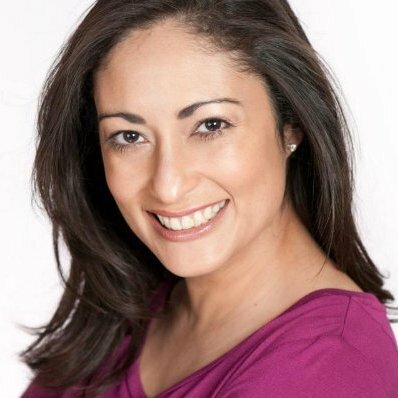 In 2012, she was named one of Wells Fargo and Univision’s 40 Hispanic Leaders under 40 in Arizona. Heidi is an avid reader and dreamer. She loves to hike and enjoys nature. She is married and has a young son. Her family thinks it is important to acknowledge others with a smile while making friends and creating community. As a consultant to PeacePraxis’ outreach efforts, Heidi will be reaching out to past clients, as well as new ones. Please join PeacePraxis in giving Heidi a warm welcome! The middle school school years. It’s a time fraught with hormonal fluctuations, friendship challenges, identity formation, and moral dilemmas. So, where does kindness fit in? How can we foster a kinder middle school culture? Read more for free lessons and simple tips!